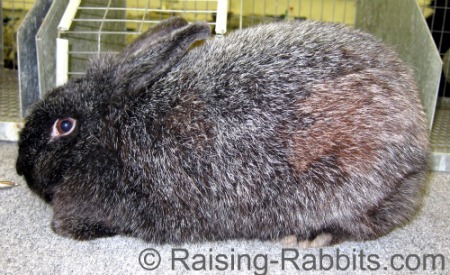 Silver Fox Rabbit: Get the history, description, standards, photos of this black silvered rabbit with fur like a fox. Is this dual use rabbit right for you? The Silver Fox (USA) is the 3rd breed accepted by the forerunner of the ARBA, granted in 1925. 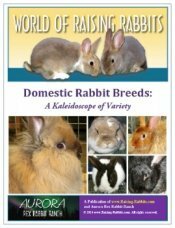 Specific fur traits along with commercial type and excellent meat production qualities are the crux of this breed of rabbit. He wanted a rabbit with fur similar to that of a black fox – long, dense, and somewhat silvered. 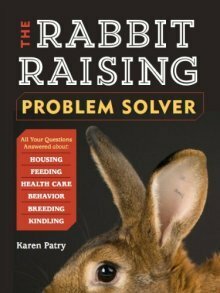 The new breed also needed to be utilitarian, meaning have a meat rabbit frame weighing more than 8 pounds and have a meat-producing body type. Exactly HOW he achieved this goal is not clear, as he never divulged his exact process. Because his new breed was significantly larger than his Silver rabbits, it was initially known as the Heavyweight Silver. But the name soon changed to American Silver Fox, and then to Silver Fox. In the early 1970’s, as the breed teetered on the brink of extinction, eighteen breeders formed the National Silver Fox Rabbit Club in 1971. Over the next 40 years, the breed has made a modest comeback. Once on the Livestock Conservancy ‘critically endangered’ list, it is now listed only as ‘threatened,’ which is very good news, as the breed is found only in the USA and Canada. The Silver Fox is no longer listed among the rarest 15 US breeds on the Rare Rabbit Breeds List (2014). The Silver Fox is a large meat rabbit weighing 9-12 pounds. Its fur is long (1.5”) and dense. The guard hairs are lightly silvered, not detracting from the overall black coat. In other words, one should clearly see a black rabbit, not a completely silver one. Silver Fox fur should be reminiscent of the fur of the silver fox itself, which was one of the driving forces behind the creation of the breed. The Standard specifies even silvering, distinct, sharp, bright; not too heavy, not too light. The breed was originally recognized in two varieties, black and blue, however interest in blue waned and the variety was dropped. Both Blue and Chocolate varieties are currently under development.